Continuing our nutrition series, let’s talk protein this week! Protein is a building block for our body tissues and is needed for the growth and maintenance of these tissues. It is necessary for our muscles, hair, nails, skin, eyes and internal organs, especially the heart and brain. Protein is found in meats and fish, soy, nuts and seeds, and also in some vegetables, like leafy greens, corn, green peas, lima beans and sprouts. Eating protein makes us feel full because it works with the body’s mechanism that affects our satiety. Many nutritionists feel it is important to eat some type of protein at every meal, and I usually agree. I especially like a protein filled breakfast as a good start to your day. My mornings usually start with a delicious and nutritious nutritional shake. The brand I choose is filled with high quality protein, good fats, and a nice amount of fiber, as well as a full panel of vitamins and minerals. I can make one quickly in my blender, and turn them into a Super Shake, by adding some of the following: ground flax seed, Greek yogurt, avocado, greens, and always some type of fruit (usually berries!). I promote eating food to get our nutrition, but you’ve read in other blog articles that this can be a challenge due to our food sources and our sometimes less than optimal health. Life can get hectic, and we may resort to food that isn’t as high quality as our body likes! I advocate eating meals and sitting down to enjoy the meal, rather than snacking all day long. However, sometimes we all need to grab a snack. If you find you have days where you might skip a meal, only to be ravenous before your next one, then grab a good protein snack, like hard-boiled eggs, nuts, cheese, or jerky. These foods are also really portable, which we often need! Full Circle Vitality Group just began carrying really neat shaker bottles called Pogo Blenders. These bottles are made in the USA from recyclable materials, they are BPA Free and dishwasher safe. They have a convenient carabiner clip and an effective dual-action agitator so whatever you are blending comes out nice and smooth! And, they hold 28 ounces. These Pogos can make protein shakes, nutrition drinks, and even mix up scrambled eggs and mixes. They are perfect for those on-the-run times when you need a quick meal. You can get your very own bottle for only $12 each. 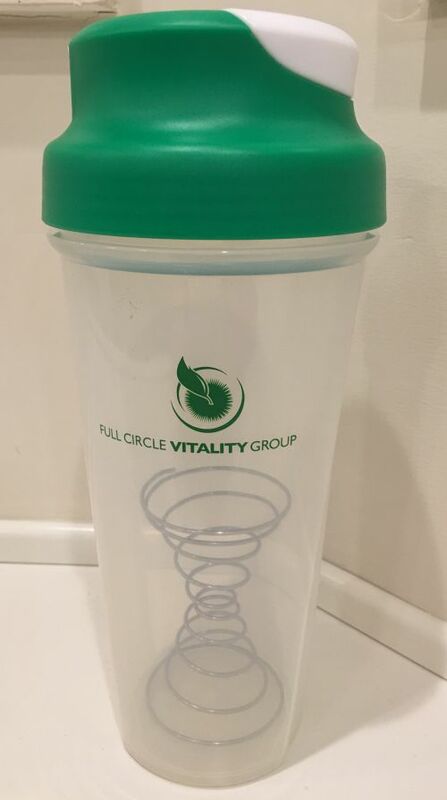 You can find the nutritional shakes I like best on the website under the products tab at (https://www.fullcirclevitalitygroup.com/products.html). Look under the Solutions4 section. The shakes come in four flavors: vanilla, chocolate, strawberry and orange. I will be happy to give you samples to try, too, if you aren’t sure about nutritional shakes. Give us a call! However or whenever you eat, be sure to include some type of protein in each meal so you are full, satisfied, and optimizing your nutrition!